Draft: 2014, Tampa Bay Rays, 12th rd. Braxton Russell Lee…part of 2014 draft class that saw nine Ole Miss players selected in that year's draft, the most of any school...hit .281 with nine doubles, 25 RBI and 56 runs scored for the Rebels as they won the SEC Western Division and finished third at the 2014 College World Series in Omaha, NE…played two years at Pearl River Community College before transferring to Ole Miss...earned All-MACJC, All-State and All-Region selections both seasons at Pearl River…hit .406 as a sophomore, leading Pearl River to the MACJC South Division title that year…also hit .365 with 29 stolen bases as a freshman…lettered all four years at Picayune High School, earning All-District and All-State selections. Spent entire season in Double-A, appearing in 67 games with Montgomery and 60 with Jacksonville following midseason trade to Marlins from Tampa Bay...Won Southern League batting title after hitting career-best .309 (147x476). Also led league in hits; ranked second in runs scored (81) and fourth in on-base percentage (.395)...Set career highs in runs scored, hits, doubles (21), home runs (3), RBI (37), walks (65), on-base percentage (.395), slugging percentage (.384), and OPS (.779); tied career high with three triples (also, 2016). Also had career-best 43 multi-hit games (previous high, 27 in 2015)...Slugged first professional home run on April 9, a solo shot in third inning of Biscuits' 6-1 win over Biloxi...Drove in nine runs in April, tying his single-month high (also, July 2016). Repeated single-month best of nine RBI in July...Posted a 33-game on-base streak from April 18-May 25 (.341/45x132, 5 2b, 2 3b, hr, 10 rbi, 18 bb). Streak was second-longest in Southern League, behind a 36-game streak by Mobile's Forrestt Allday... Recorded career-best streak of five consecutive multi-hit games, all two-hit efforts, from May 15-21 (10x20, 3 2b, 2 rbi)...Set season high and tied career high with two stolen bases on May 18 against Jackson (7x; last, 7/24/16 at BIR)...Earned first career Player of the Week award for May 15-21; went 11x23 (.478) in six games, with three doubles, two RBI, and four stolen bases for Biscuits...Named to first career All-Star team after hitting .311 (76x244) with nine doubles, two triples, two home runs, 16 RBI, and 10 stolen bases prior to break (ASG was cancelled due to rain)...Batted .337 in both May (35x104) and June (30x89), his highest career average in a full month. His 35 hits in May also marked a career-best total for any month... Acquired by Miami on June 26 and assigned to Jacksonville; went 2x4 with an RBI in his first game with Jumbo Shrimp on June 28...Tied career highs with four hits (5x; last, 4/10 vs. BLX) and three RBI (4x; last, 4/20 at JXN) on June 29 vs. Mobile...Recorded a hit in first five games with Jumbo Shrimp, going 11x20 (.550) with two doubles, a home run, six RBI, and four multi-hit games...Posted career-best 13-game hitting streak from June 15-July 2 (.460/23x50, 3 2b, 3b, hr, 6 rbi); also had a 12-game hitting streak from May 11-22 (.388/19x49, 3 2b, 3b, 3 rbi)...Named Southern League Player of the Week for June 26-July 2 (.571 AVG/12x21, 2 2b, 3 3b, hr, 6 rbi); marked second award of season and career...Batted in leadoff spot in 110 of 127 games; hit .307 (135x440) with 75 runs scored, 20 doubles, two triples, and 35 RBI...Led Jacksonville in hits, walks, and stolen bases (20); tied for second on team in doubles... Named to Soutern League Postseason All-Star team; batted .306 (71x232) with 12 doubles, a triple, a home run, 21 RBI, and a .406 on-base percentage in second half...Hit .143 (2x14) with a run scored, a double, and an RBI in three postseason games...Appeared in 20 games for Salt River in the Arizona Fall League; hit .347 (26x75) with two doubles, a triple, seven RBI, and eight stolen bases. Played in AFL Fall Stars Game, and finished season second on team (sixth in AFL) in batting average and third on team (fourth in AFL) in stolen bases. April 4, 2019 CF Braxton Lee assigned to Binghamton Rumble Ponies from Syracuse Mets. February 25, 2019 OF Braxton Lee assigned to New York Mets. December 13, 2018 Syracuse Mets claimed CF Braxton Lee off waivers from Jacksonville Jumbo Shrimp. November 27, 2018 Miami Marlins sent CF Braxton Lee outright to Jacksonville Jumbo Shrimp. November 20, 2018 Miami Marlins designated CF Braxton Lee for assignment. October 2, 2018 Miami Marlins recalled CF Braxton Lee from New Orleans Baby Cakes. August 11, 2018 CF Braxton Lee assigned to New Orleans Baby Cakes from Jacksonville Jumbo Shrimp. July 13, 2018 LF Braxton Lee assigned to Jacksonville Jumbo Shrimp from New Orleans Baby Cakes. June 18, 2018 LF Braxton Lee assigned to New Orleans Baby Cakes from Jacksonville Jumbo Shrimp. 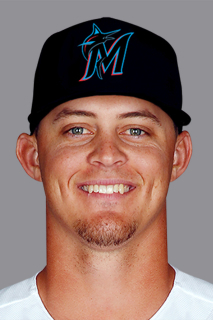 June 15, 2018 LF Braxton Lee assigned to Jacksonville Jumbo Shrimp from Jupiter Hammerheads. June 2, 2018 LF Braxton Lee assigned to Jupiter Hammerheads from New Orleans Baby Cakes. May 1, 2018 New Orleans Baby Cakes placed LF Braxton Lee on the 7-day disabled list. April 13, 2018 Miami Marlins optioned CF Braxton Lee to New Orleans Baby Cakes. April 5, 2018 Miami Marlins recalled Braxton Lee from New Orleans Baby Cakes. April 1, 2018 Miami Marlins optioned CF Braxton Lee to New Orleans Baby Cakes. March 29, 2018 Miami Marlins recalled Braxton Lee from New Orleans Baby Cakes. March 20, 2018 Miami Marlins optioned CF Braxton Lee to New Orleans Baby Cakes. November 20, 2017 Miami Marlins selected the contract of Braxton Lee from Jacksonville Jumbo Shrimp. June 27, 2017 CF Braxton Lee assigned to Jacksonville Jumbo Shrimp. February 24, 2017 OF Braxton Lee assigned to Tampa Bay Rays. April 5, 2016 CF Braxton Lee assigned to Montgomery Biscuits from Charlotte Stone Crabs. March 3, 2016 CF Braxton Lee assigned to Tampa Bay Rays. April 6, 2015 CF Braxton Lee assigned to Charlotte Stone Crabs from Hudson Valley Renegades. July 4, 2014 CF Braxton Lee assigned to Hudson Valley Renegades. July 1, 2014 Tampa Bay Rays signed OF Braxton Lee.